Introducing Kristi, our 2016 garden blogger! As your faithful blogger this season, I thought I’d introduce myself. I’ve always had gardens myself, but that apparently wasn’t enough! I began working on my family’s gardens, neighbors’ gardens, worked for companies, had my own clients…gradually developing my knowledge and expertise along the way. Another passion is science. After getting a Bachelor’s in biology from Amherst College, I went to Rutgers University, where I got a Master’s in ecology and evolution. My research was on the effects of an invasive shrub, Lantana camara, on rainforest regeneration in Australia. Studying lantana and weeds in general gave me a solid understanding of the ecology of invasive plants that I apply to my gardening practices and strategies. When I look at a garden, I don’t just see what is there now, but what is likely to happen in the future. This includes thinking about mechanisms of dispersal (via seed and plant structures), competition, environment, and surrounding or hidden areas (“refuges”) where weeds grow that have the potential to introduce new seed into a garden. Weeds are kind of my thang…so much so that in addition to my work with Peterson’s I am working with the MN Dept of Natural Resources Invasive Species Coordinator to research and write a manual on weed control for the state’s forestry industry. Of course, desired plants are great, too! 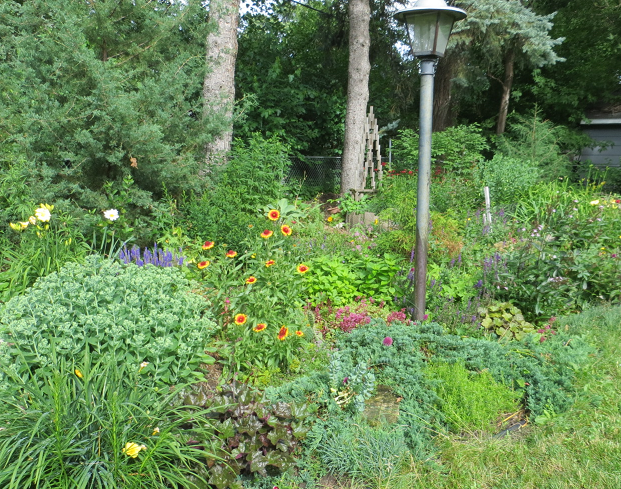 I am constantly adding new varieties and species to my gardens, which makes them kind of a hodge-podge, but it gives me a good idea of how and where things grow. Even ornamentals can become invasive, both in the garden and in natural areas…but that’s the subject of future blogs! Hope you enjoy and learn from what’s to come, and if you have any questions, concerns or comments or would like a consultation, feel free to contact me at Peterson Lawn!